Amal forged her own career success as an international law and human rights barrister, before later becoming a fashion icon. The 40-year-old, who welcomed twins with husband George in June last year, has now spoken out about finding love with the actor. The couple, who met at a party at his Lake Como house in Italy, became engaged in April 2014, and wed five months later. In a rare interview with US Vogue, Amal opened up about how she hadn’t assumed that she was going to find love or become a mother. The Oxford University alumni went on to reveal that she hadn’t been prepared to settle down. Amal explained: “And I wasn’t willing or excited about the idea of getting married or having a family in the absence of that. The New York University School of Law graduate also discussed the pair’s 10-month-old twins, Ella and Alexander. During the chat, she revealed the tots get into bed with the couple in the mornings for some quality family time together. Amal went on to reveal that the youngsters had said their first words. She said: “We’ve had some ‘Mamas’ and ‘Dadas’. The human rights activist, who is the cover star for the May issue of US Vogue, stayed in touch with George, 56, after they met, before love blossomed between the pair. 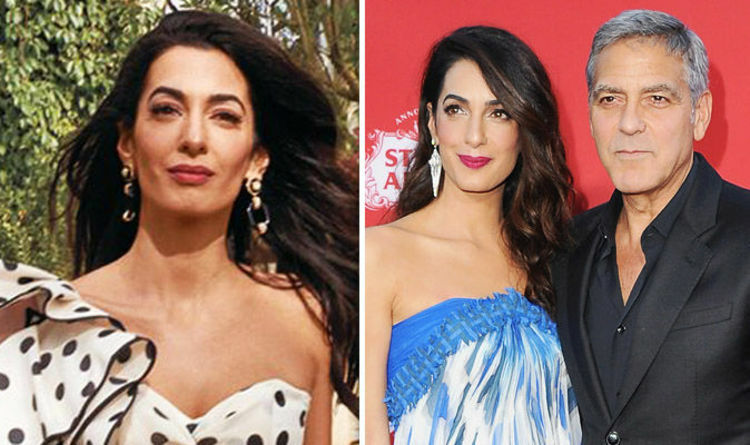 Speaking about meeting Amal for the first time, the actor said: “Of course she was beautiful, but I also thought she was fascinating, and I thought she was brilliant.